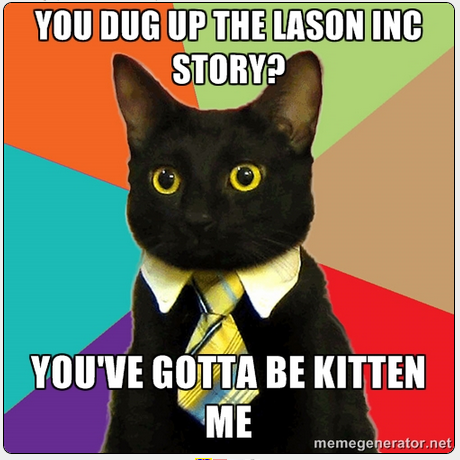 This is how we think the Rauner Campaign reacted to all the hubbub over the Lason Inc story. With all the cash laying around over at Rauner Inc Headquarters, we here at the Truth Team have to wonder if they haven't made a call (or...for that matter...at trip) to Boston to get the Romney playbook on things like this. There *has* to be some lessons learned that the Romney Team learned that they could be sharing, right? As for all those Bruce Rauner parodies (and how there are too many of them and they aren't funny! ), perhaps a new way to go after him is with Business Cat? Have a Business Cat Meme you want to make about Rauner? Send it our way! Tipthetruthteam@gmail.com.